Since the end of January, vocal students have been hard at work preparing scenes from eight different musicals and operas. All that hard work will come together tomorrow, Friday the 17th at 7 p.m. on the stage of Reith Recital Hall in the Music Center. 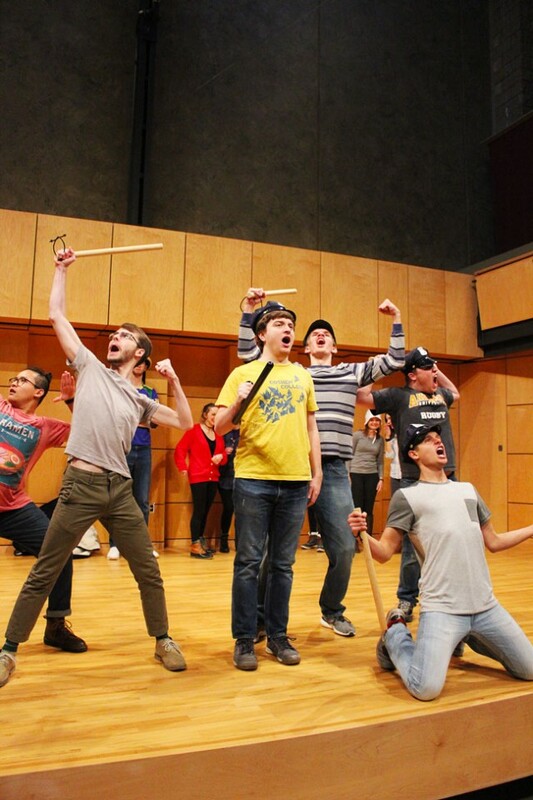 Every few years, the music and theater departments team up to produce a full-fledged musical, but this year, as in other years, the music department is producing selections from many different musicals. According to Professor Debra Detweiler Brubaker, the opera scenes allow students to engage with the music in a different way through movement and dancing. In addition to adding dancing and more dramatic expression into the music, the students get to use props and costumes, some even raiding their childhood dress-up collection for inspiration. Sophomore Lukas Thompson’s portrayal of his character Sweeney Todd will be less cute and more disturbing. As he portrays the demon barber, his prop will be a razor that he uses to cut the throats of his victims. “It’s fun to play a dark and troubled character from time to time,” Thompson said. Senior Maggie Weaver is also going for a more sinister, mysterious vibe with her trench coat as she plays one of the witches from Wicked. Though there are some props and costumes, Weaver says part of appeal of Opera Scenes is its simplicity. In addition to her appearance as a witch, Weaver choreographed the ensemble pieces for the Opera Scenes. “The choreography was fun to put together! I loved working on the scene from Pirates of Penzance,” she said. According to Weaver, the most difficult thing about the choreography for the show will be figuring out how to fit all of the dancing on the small stage in Rieth. Gustafson-Zook enjoys the opportunity to incorporate dance into her singing. Gustafson-Zook also enjoys working with other members of the ensemble in the farcical piece entitled “I’ve Decided to Marry You” from the musical A Gentleman’s Guide to Love and Murder, in which she plays one of two lovers. In the musical, a man struggles to hide his two lovers from one another, resulting in what Gustafson-Zook calls “a fiasco.” Senior Morgan Short and junior Jacob Zehr play the two other characters in the scene. As for Brubaker, she said she cannot name one scene she is more excited about than the others. “The opening and closing scenes are full-cast pieces, involving all 25 members of the cast and featuring staging and choreography by Maggie Weaver, who always does a great job with creativity and splash,” said Brubaker. Though busy schedules have made the past few weeks of rehearsals demanding, Weaver is confident that the hard work will pay off. The Opera Scenes will be performed in Reith Recital Hall on Friday, March 17 at 7 p.m.
GC students, faculty, and staff are free with I.D., general admission is $5 for students and seniors, $7 for adults.